The HP 8413A Phase - Gain Indicator is for use with the HP 8407A Network Analyser or the HP 8410C Network Analyser for displaying the relative phase and magnitude on the Meter. The original cost was $2,100 in 1980. I have bought the Operating and Service Manual. 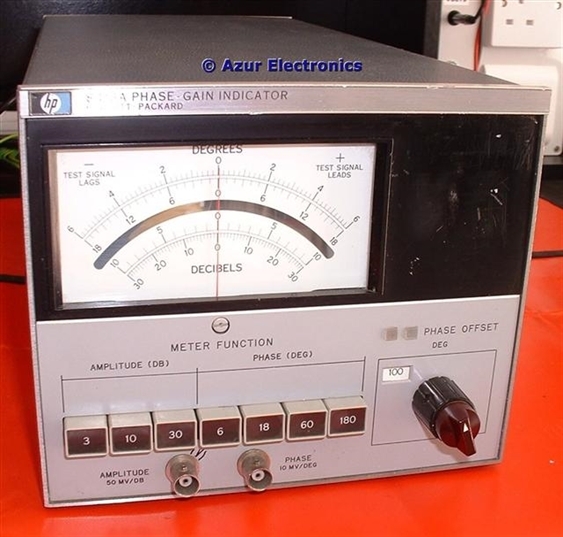 This plug-in unit contains a Meter which displays the relative amplitude and phase difference between 2 input signals (the REF and TEST inputs on the 8407A or 8410C Network Analysers). Amplitude is displayed in dB with ±3dB, ±10dB and ±30dB scales. Phase is displayed in degrees with ±6°, ±18°, ±60° and ±180° scales. A front panel PHASE OFFSET control changes the phase relationship of the input signals in 10° steps up to 180°, with a +ve or -ve PHASE OFFSET switch and indicator lamps. 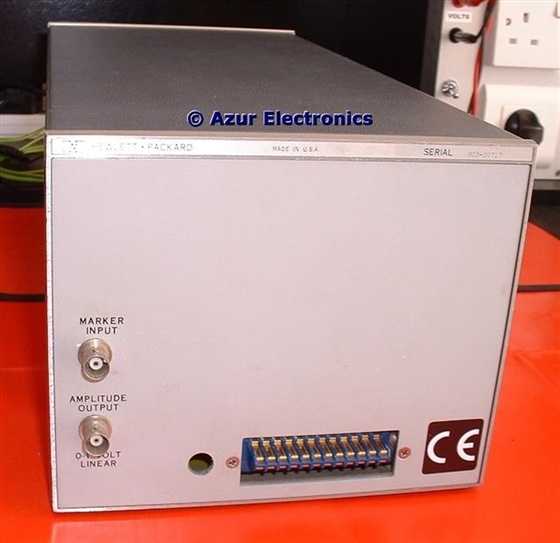 Amphenol Blue 24 way Connector for 8407A, 8410C, 8418A Mainframes and 8412B, 8414A, 8414A Plug-Ins, see Network Analyser Internal Connections for details. * The front and rear panel outputs for PHASE and AMPLITUDE are useful for monitoring on an oscilloscope or DMM to provide an indication of the amplitude and phase difference between the signals. Bought the 8413A (S/N 903) on eBay DE. Started testing with 8407A, see HP 8407A Network Analyser for details. The Operating and Service Manual for the 8413A explains how to make: single frequency transmission measurements; single frequency reflection measurements; swept frequency transmission measurements; and swept frequency reflection measurements. Tested ok. The 8413A is useful for displaying the amplitude and phase difference between signals at a single frequency, or for swept frequency measurements at a slow sweep speed. Next task is to work through HP Application Note 121-1 Network Analysis With The HP 8407A 0.1 - 110MHz to gain a better understanding of the 8413A. See Operating HP 8407A Network Analyser for more information. Using the 8413A with the 8407A and the -ve PHASE OFFSET indicator lamp wasn't working. Replaced with a 28V 0.04A Midget Flange Lamp and now working ok. The 8413A is really useful for quick checks of amplitude and phase measurements, both at single frequencies and for swept bands.